St. Marks Cathedral whose foundations were laid in 1808 obviously is devoted to St. Mark who is believed to be one of the writers of the holy gospel. The Cathedral is situated on the busy M.G. Road of Bangalore. Its architecture is inspired, to quite a large extent, by the 17th century St Paul's Cathedral. It is a stately building with a row of Roman arches and an imposing central dome. 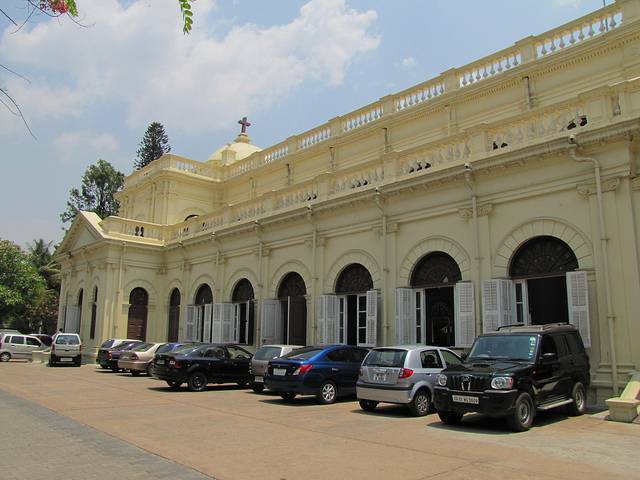 The place boasts of having one of the best-maintained external bells amongst all the churches in the city. Roman archers along the walls are one of the most beautiful features of the Cathedral. Even the stained glasswork adds to its beauty. The ambience both inside and outside is quite tranquil. The Cathedral is open throughout the week and service is conducted every Sunday. The church is a part of the Church of South India (CSI).